The Waikato Bay of Plenty has a long history of performing in New Zealand’s top football league. 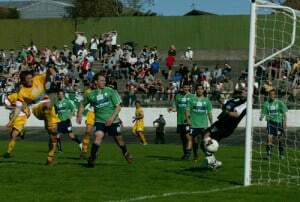 Prior to WaiBOP United and Waikato FC, the region has been represented by clubs such as Tauranga City United, Melville United, Waikato United, Mt Maunganui and Hamilton AFC. Waikato FC can trace its roots to two public meetings, called in mid-2003 in response to New Zealand Soccer (as the national body was then known) plans to replace the existing club-based national league with a new eight-team, more geographically based franchise league due to start in October 2004. 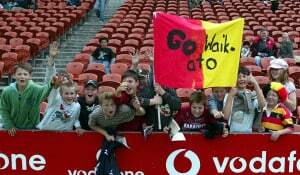 At the second of two meetings at Galloway Park in July 2003, leading Waikato club representatives voiced their approval of the concept of forming a franchise to contest a revamped national league. The changes effectively threw a lifeline to the province, which had not been represented at national league level since 1997-98. Football activist Grant Stantiall, at the time best known as Centre Circle Waikato convener, led the charge to form the franchise. Stantiall had no club affiliation at the time but had convened the non-partisan soccer service group for the past three years, and previously worked on Waikato United and Melville United national league committees. He noted that the feedback from the meetings was that absolutely everyone was in favour of Waikato competing in the national league – but everyone there was already overcommitted to their own clubs. That led to Waikato FC being formed as an entrepreneurial entry which placed no direct financial burden on existing clubs. Whereas many saw only roadblocks in the demanding league licence criteria, to Stantiall the pernickety requirements only served to remind him that there was an under-used state-of-the-art rugby stadium (Waikato Stadium) in the middle of town. Stantiall was assisted in club formation by the likes of Claudelands Rovers keeper Seamus Marten, Melville United player Gordon Glen Watson and Melville secretary Mary Sproul, and subsequently attracted former Cambridge administrator and referee Keith Ward, who at the time was perhaps best known for being a one third owner of the Breakers basketball team, and became Waikato’s inaugural general manager. Natural Gas Corporation business development manager Clive Morgan also came on board, drawn into the game by having a son who plays, and he became the club’s inaugural chairman. Stantiall also pulled in Hamilton City councillor Roger Hennebry — a former Claudelands player who once had a trial with Hull City — and miraculously got Waikato Stadium management talking realistic figures about hosting soccer matches, while the council’s regulatory services manager and former top player, Graeme Fleming, also joined Stantiall on the board. In applying for a league berth, Waikato FC made a DVD presentation, a financial presentation by Morgan, and a civic overview from Hennebry. James Pamment and Declan Edge were appointed as Waikato’s coaching duo in the inaugural 2004-05 season, with Pamment assuming the mantle of an English-style football manager, and Edge as his hands-on coach. 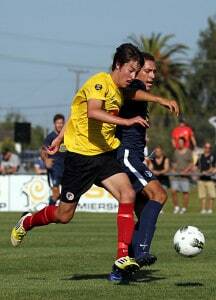 The pair had previously worked together with Tauranga City United during the 2003 winter northern league season. Waikato featured a squad which included the likes of Che Bunce (captain), Michael Utting, Mark Fulcher, Craig Flowerday, Cole Tinkler, David Samson, Garry Board, LJ Pijnenburg, Michael Mayne, Grant Cooper, Sam Wilkinson, Aaron Scott and Steve Callinan. Playing most home games at Waikato Stadium – but also making an appearance in Rotorua and Mt Maunganui – Waikato made the three-team league playoffs in the first season, before losing 4-1 to Waitakere United in the minor final. In 2005-06 Pamment and Edge were again in charge but Waikato finished seventh, with a squad which included Che Bunce, Tamati Williams, Danny Donegan, Matt Williams, Michael Gwyther, Adam Crump, Aaron Scott, Jakub Sinkora, Hindrich Hahn, and Jeremy Field. Joe Sprangers came on board as development manager, from a background in touch. In 2006-07 Pamment and Edge were not reappointed, with Dave Edmondson – who had travelled north from Lower Hutt – getting the nod, with Ray Pooley his assistant. Wintec-sponsored Waikato included Danny Robinson, Grant Cooper, Tim Schaeffers, Matt Cunneen, Stu Wilson, Michael Mayne, Matt Williams, Brad Scott, Paul Caton, Aaron Scott, Stanley Waita and Godwin Bebeu. But after six winless matches Edmondson resigned, Pooley held the fort for a couple of matches, and former Waikato United coach Roger Wilkinson returned to Hamilton to take over as coach, but Waikato again finished seventh. Keith Ward succeeded Clive Morgan as chairman. In 2007-08 Waikato improved to fifth place, with Wilkinson again at the helm, with Mark Cossey as his assistant. The squad included Danny Robinson, Che Bunce, David Samson, Hone Fowler, Aaron Scott, Joe Simpkins, Luke Findley, Jeff Sole, Steven Holloway, Stewart Watene, Chris Wood, Matt Friel, Shaun Van Rooyen, and English imports Rob Gill and Dale Williams. Gill and Dale Williams were employed as Football Development Officers and conducted a series of in-school programmes around the Waikato. Keith Ward was chairman, Joe Sprangers development manager, and James Raffan operations manager. In 2008-09 Waikato appointed Kevin Fallon as coach. However club financial problems meant he never took the helm on a competitive match, and Dave Edmondson returned to do the job for free. Waikato made Centennial Park in Ngaruawahia its base for the season, and it drew enthusiastic backing, with many of the football community there taking a week off work to conduct a working bee to get the ground up to standard with fences and seating installed. Edmondson’s squad was put together at relatively short notice but it was effective. Players included skipper Graham Pearce, Joe Simpkins, Joel Mathews, Paul Stewart, Steven Holloway, Shaun Van Rooyen, Craig Wylie, Sam Margetts, Marco Rojas, Nathan Strom, Stu Hogg, and US goalkeeper Greg Walters. 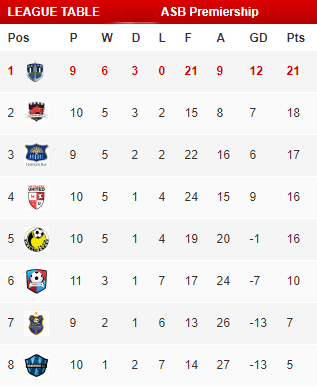 Waikato were league leaders at Christmas time, but faded to finish sixth. Preceding the 2009-10 season, with Edmondson unavailable, former Manchester United player Paul Parker was briefly touted as a possible coaching option, and he was guest speaker at a fundraising dinner at SkyCity Hamilton Casino. Eventually founding Waikato skipper Che Bunce was appointed player-coach, with the team again based at Ngaruawahia. Waikato FC also secured former New Zealand Knights assistant manager Kevin O’Leary as an assistant to Bunce. O’Leary, 52, had an extensive background in professional football in the Hyundai A-League, as New Zealand Football Manager of National Development and as a physiotherapist, fitness coach and goalkeeper coach at The FA, Walsall and Wolverhampton Wanderers. The Waikato squad included Shaun Van Rooyen (captain), Jason Chewins, Richard Beard, Corey Hitchens, Mauri Wasi, Dan Peat, Michael Gwyther, Mikael Munday, Charlie Hoyle, Tewi Te Pou, and Joe Simpkins. Waikato finished bottom of the league for the first time. The board consisted of Charlie Panakera, (chairman), Chris Ryan, Maxine Williams, Brendon Coker, and Mohammed Hassan, while James Raffan was operations manager. A deal with Matamata-based community television station TV Central led to Chasing Time Productions producing eight episodes of “The Waikato Football Show” which screened on the station. In 2010-11 North Shore-based Willie Gerdsen was appointed coach, with Waikato shifting their home base to Fred Jones Park – adjacent to Waikato Stadium. Gerdsen brought a fair chunk of his winter East Coast Bays players south and the squad included Nathan Palmer, Milos Nokolic, Ryan Zoghby, Jason Hicks, Nick Branch, Jack Beguely, Nathan Strom, Maksim Manko, Jason McKeown, and Joe Bresnahan. Waikato finished sixth. Brendon Coker succeeded Charlie Panakera as chairman, while the Waikato-Bay of Plenty Federation was contracted to provide administrative services for the season. Hamilton, with former Waikato players such as Michael Mayne, Mark Fulcher and Jason Hicks lending experience to a squad where Tyler Boyd, Ryan Thomas, Jesse Edge, Adam Thomas and Tyler Lissette were the youngsters catching the eye. Edge’s assistants were Danny Donegan and Neil Mouncher, with Graeme Nobilo team manager. Once again Waikato finished sixth. In 2012-13 Edge began the season at the helm, with new signings Rory Turner, Jack-Hobson McVeigh, Sam Jasper, Alexis Carcamo Varela, Eder Franchini, Matt Upton, and Dave Parkinson, while Sam Margetts returned from Hawke’s Bay. During the winter Tyler Boyd was signed by Wellington Phoenix, earning Waikato its first professional player development fee under FIFA statutes. Four games into a losing start to the season Edge was relieved of his duties and was replaced by Mark Cossey, who was left to deal with a mass player walkout but cobbled together a side and enough results to ensure Waikato again finished sixth. In May 2013 Waikato Bay of Plenty Football were awarded an ASB Premiership license meaning WaiBOP United will take the place of Waikato FC in the league.